bebop spoken here: In The Round With Phronesis @ Sage Gateshead May 27. The CD, the fifth release since the trio’s formation in 2005, is a live recording of last year’s London Jazz Festival appearance. 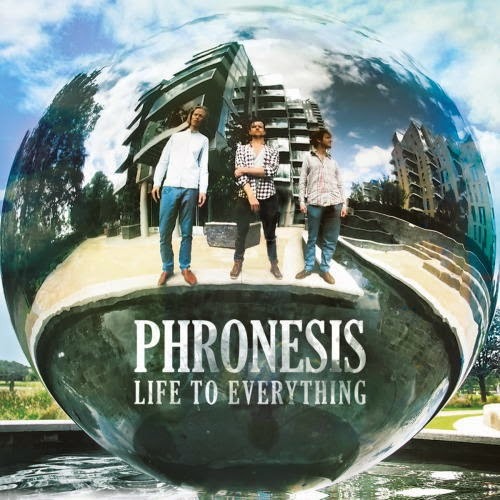 Phronesis in concert reaffirms the view that Hoiby, pianist Ivo Neame and Swedish drummer Anton Eger are best heard ‘live’. A democratic working unit, the musicians’ frequent eye contact indicated approval of a nuanced reshaping of a familiar phrase or shift in tempo. Eger’s kit set-up (an atypical arrangement) no doubt occupied the thoughts of drum heads in the audience while the rest of us simply sat in awe observing a percussion master at work. Hoiby and Neame couldn’t find a more musical drummer in a month of Sundays, making the trio a true partnership of equals. A first long set – We played way too long said Hoiby during the second set – featured material from the new release including Deep Space Dance and Wings to the Mind. Highlights of the set and indeed the entire concert were Behind Bars (scorching stuff) and a lazily swinging Eight Hours. A truncated second set heard the amazing Eger on Happy Notes and the trio’s unity of purpose on Urban Control and Fraternal. The intimate audience enjoyed the performance and it would appear the Phronesis boys did too! Anton was something else to watch! Could have done with a bit more pianistic exuberance we felt - we were just waiting for Ivo to get really going - it didn't come. An excellent gig all round (ha, ha! though. I agree Hugh, Ivo could have done more.